My kids love jello! Any opportunity we have to make it, puts a smile on their faces. Holidays are a perfect time to make this little jiggly treat. With its vibrant color, and a little creativity, it can be more than just a yummy treat, it can actually become an edible decoration.Making Jello jigglers is just as easy as making regular jello, it just involves two extra easy steps. You can have these fun shaped little treats that both kids and adults will devour. To turn regular jello into “jigglers” is just a matter of adding less water to the gelatin mixture. Adding less water allows the gelatin to become thicker and possible to hold its shape when cut with a knife or cookie cutter. First, start with whatever flavor you like. In honor of St. Patrick’s Day coming up, I chose lime for obvious reasons. I will be using just one (6 oz.) box of gelatin, which produced approximately 24 (1 1/2 inch wide) shamrock jigglers. You can make a larger batch if you like more than 24 jigglers. I will give ingredient amounts for that below. Empty one 6 oz. box of gelatin mix into a glass bowl. Add 1 1/4 cup boiling water to the powder and stir for 3 minutes. This is the point that if you were making original jello you would add cold water. DO NOT add cold water to this, otherwise it will not be thick enough to hold the shape that you cut out. Once the boiling water and gelatin have been stirred, pour into a 7 1/2 x 11 inch glass baking dish. Make sure that all bubbles are removed from the top of your jello at this point. You can simply take the back of a spoon and pop them all. If you don’t take them out, the air pockets will mold into your jello and you will have a very bumpy finish once chilled. Then refrigerate for 3 hours or until firm. Once the jello is firm, put about an inch of warm water in the bottom of your sink. Then, add your firm jello to the warm water, Let the jello sit in the water for approximately 15 seconds. This step will help the jello release from the glass easily. When setting the jello into the water, make sure that the water only goes about a half inch above the level of your jello. If the water goes over the edge of your dish and ends up in the jello, it will dissolve it and that is not good! Once the jello has sat in the warm water bath, remove from water and dry bottom of your dish. Next, take your chosen cookie cutter shape and start cutting. Start in the corner and simply push your cookie cutter straight down. Make sure that your cutter reaches all the way to the bottom of your pan. If you don’t cut all the way through, you will not have a clearly designed shape when you take it out. Continue cutting until the entire pan is cut. Next, take a small spatula and run it around the edges of the jello. At this point, you can start pulling the excess jello that surrounds your shapes out of the pan. The excess comes out quite easily just go slow. You are then left with a pan of beautiful little treats. them a more festive look. Place gelatin into a glass bowl. Add boiling water and stir for 3 minutes. Place water gelatin mixture into a 7 1/2 x 11 glass baking dish. Refrigerate for 3 hours. Place bottom of dish into warm water for 15 seconds. 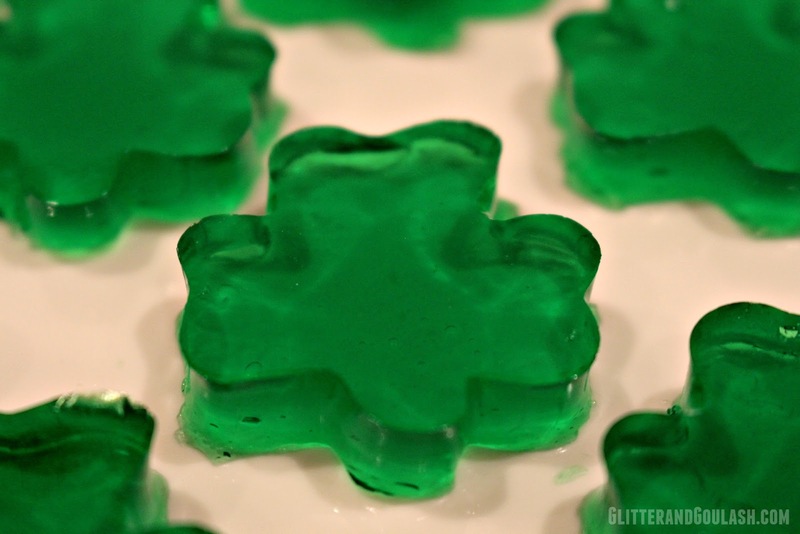 Cut jello into 1 inch cubes or into desired shape with a cookie cutter. Place gelatin into a glass bowl. Add boiling water and stir for 3 minutes. Place water gelatin mixture into a 9 x 13 glass baking dish. Extra Tip: Put these fun little treats into your children’s lunch box. It is a fun way to celebrate a special day or holiday when they are at school. Be creative, red/cherry heart shape for Valentines Day, purple/grape egg shape for Easter, or simply a fun shape in their favorite flavor! The options are endless!